My husband told me in no uncertain terms that I must not organize his office, or he won’t be able to find anything. Out of honor to my husband, I decided to leave the office out of the double video workshop “Organizing for a Fun Homeschool.” Well, I found another office-looking area in our house. It is a built-in desk connected to the kitchen, where my oldest son does his math, and where I edit videos to put into YouTube. It is this office space that I recently organized. 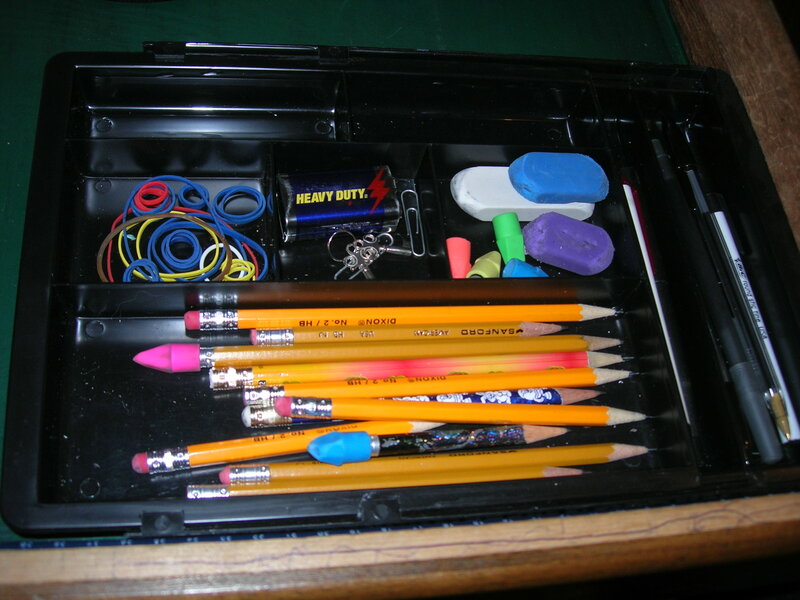 First of all, office supplies like pencils, pens, paper clips, and rubber bands can be placed into a drawer organizer that you can get at an office supply store. It really is easier to find supplies if there is a designated area for each thing. Many people prefer to have a pencil holder on the top of their desk, like a can or something similar. For me, the fewer things that are out, the more restful I feel. I try to clear off everything I can and not have any brick-a-brack cluttering up my space, which would cause me not to have enough room to work. Many times I need to set down a binder or a camera, and there needs to be plenty of space around the computer to work. Simplicity is the key. 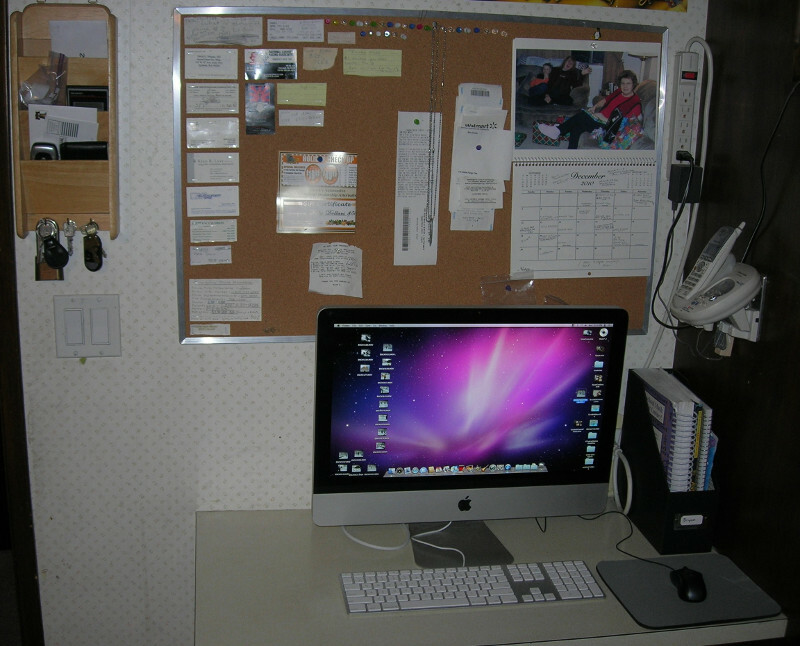 Secondly, a large bulletin board above your desk area is a great way to organize your to-do’s. Just pin something to the board if you don’t want to forget it. For example, I needed to make an appointment for my son’s teeth to be extracted by the dentist, so I pinned that paper to the bulletin board. The bad part of doing this is that the bulletin board inevitably becomes overcrowded, and you can’t find things very well. (I’m embarrassed to say that I have an example of an overcrowded bulletin board in my YouTube video “A Typical Homeschool Day.” Just look at the opening scene, and you’ll know what I mean.) When it gets this bad, all you have left to do is sort through and accomplish whatever you were supposed to do. 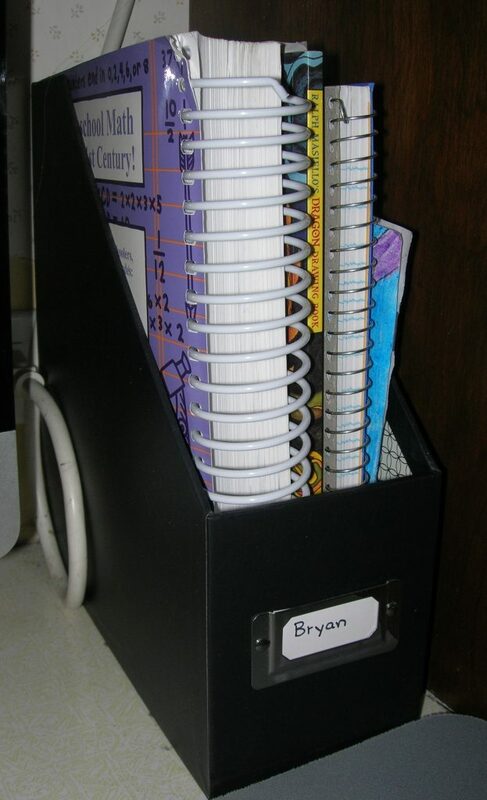 A secret that I just made up, which will help you to have a neat and tidy bulletin board, is to use staples instead of pins for items that are more permanent, like phone numbers you use all the time. You will notice a big difference on how fresh and clean your board looks just with this small tip. I always have a calendar connected to my bulletin board. I do NOT have a daytimer. I don’t believe in them. If there are too many activities to fit into a normal square on my calendar, I need to cancel something. Honestly, I don’t want to live like a chicken with a head cut off. Also, the entire family’s activities are on there, so I rarely have a schedule conflict. I always check my calendar before committing to something. Plus, my husband needs to know what I’m doing, and I wouldn’t want him rummaging through my daytimer. (Once again, I don’t believe in daytimers, but I think it would be weird for someone to be pawing through my stuff just to figure out our schedule.) Simplify, simplify, is what I say. Thirdly, I found a plastic magazine rack (like a short shelf) to go beside the computer. I put my son’s math workbook, his nature journal, the book he’s writing, and any other stuff he’s working on, in this schoolwork shelf. You could do this with each of your children that you homeschool. I’ve also seen shelves that mount to the wall, like hard plastic pockets drilled into the wall. That might be another idea for storing the children’s school books. Fourth, we have a wooden hanging shelf for keys, envelopes that need to be mailed, a place to put a wallet and cell phone, and anything else on its way out of the house. This is helpful for finding spare keys when you lock your keys in the car, or to make sure you mail your bills. Organizing the office doesn’t have to be difficult, especially if you ignore your filing cabinet. Okay, okay, I admit that the office is the most difficult room to clean in the house because of all those papers that need to be filed. Go ahead and file your paid bills, receipts, and tax forms. Find out how long you need to keep each paper, and shred the rest. An end-of-year statement trumps all 12 monthly statements, which you can safely shred, for example. I admit, this is a headache, so give yourself a huge reward when you’re done! This entry was posted on Friday, January 7th, 2011 at 7:21 am	and is filed under Organization. You can follow any responses to this entry through the RSS 2.0 feed. You can skip to the end and leave a response. Pinging is currently not allowed. Okay…..so you’ve inspired me to do some organizing today. My 2 eldest daughters just got their teeth pulled yesterday. They’re getting braces. Is your son getting braces? Gotta make some soup for them. HOpe you have a blessed day, Susan. I’m sure that all my kids will eventually need braces. I remember how horribly crooked my own teeth were, and I needed braces for years. Painful, aching mouth is all I remember. May God bless you, too! Things have gotten so out of control at my house that my husband and I are devoting two hours every Saturday to go though things. This will be our third week. The more I can throw out the better. It’s amazing how much we have accumulated! Decluttering is the #1 best thing you can do when organizing the office. It sounds like you’re well on your way! I can never keep my desk organized between homeschool papers, bills, etc. Ugh! I just organized my office too. It’s crazy the amount of junk I fit in there! That’s great! It’s always nice to have an organized office. It helps you feel like you’re caught up on everything.